This is a special tool designed to bring together the last two pieces of binding in a perfect mitered seam. No measuring and cutting and then trying to figure out how to join those last pieces! 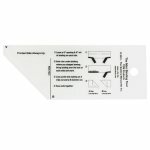 Follow the easy instructions printed on the tool and you will have a perfect ending every time.